"I am easily satisfied with ONLY the very best"
I have been a Poodle fancier, and Toy Poodle Breeder for over 20 years. I take great pride in breeding for the very best in fine quality, tiny Toy Poodles. My main goals when breeding for these small dogs, is to improve on good health, and proper conformation. I wish for my lines to exhibit the fluid grace of movement, and be true to the breed type in temperament, and elegance, that you would expect to see in a Show Ring. A Poodle you would be proud to own, a pleasure to be around, and your very best buddy. That to me is a well bred Poodle! Most of my solid color lines come from old Champion stock, so I am quite sure or what they will produce. All have impressive pedigrees, listing many fine champions, and they are regularly screened for all health problems from birth. I am involved in the Poodle History Project, and fell in love with the Original Phantom, and exquisite looking Parti patterns displayed on these Poodles! I will soon be adding some of these gorgeous, magnificent little creatures to my family, and breeding them with my solid color lines, so Please keep an eye on my site, and check back often to see what develops! 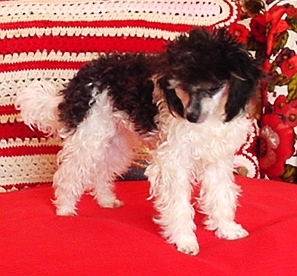 Toy Poodles are my passion, and I am very proud of the quality in my pets! Not all Teacup size Poodles are "Runts of the Litter".
" I breed for Size", so very small puppies are normal for me to see in almost every litter. I always try to breed for the very best in good health, temperament, and Conformation. I like to follow the Poodle breed standards closely, while always keeping in mind the soundness of the puppies. All my breeding stock has been extensively screened for any health abnormalities, and puppy's are checked at birth, then again at 8 weeks, for hart, lung & liver problems. Teacup, Toy, and tiny Toys are just as healthy, happy, and hardy as any other size of Poodle, but do require more care in the way they are handled, and usually don't make good pets for younger children. With plenty of good wholesome food, ( I recommend free-feeding), regular health check-ups by a qualified Vet, and lots of LOVE, they will live long and happy lives. * FREE FEEDING - This is where the puppy, or adult dog, is allowed to feed at will, any time of day that they want, using a high quality dry kibble. I also believe in a good vitamin supplement, especially made for small breed dogs, and Always keep water dishes full with plenty of clean fresh drinking water! * My Poodles are my Family! They are shown much Love, and Attention. They are socialized, and handheld from birth. Some will grow to become the Best in Show, an Agility Champion, a Hunter - Tracker, or Service Companion, but my wish for all of them is to become a very much Loved, and Treasured Family Member! ALL my dogs are A.K.C. registered unless otherwise specified. Not very puppy born is destined suitable for the show ring, nor intended to be used as breeding stock, but still they can make wonderful Pets, and Companions. I like to sell most of my Toy Poodles locally, that way I get to meat, and great their new owners, and Phone contact is Always a Must! Prices to adopt your new puppy, start at $550.00 for Males, and $650.00 for Females. Prices increase, depending on the purpose you intended for the new member of your family, and on the availability of the very smallest size of Toy Poodles. I require $250.00 deposit to reserve the Poodle puppy, or adult of your choice! Please e-mail me with any questions you may have, or to be placed on my Puppy Wish List! Come Join my Parti Poodle chat Group. * In the USA...I will only use a very safe, and reliable Ground-Transport Company. * International Shipping can be handled through "Jet-A-Pet"
All fees, crates, and Health Certificates are to be paid for prior to shipping, and are the buyers responsibility.